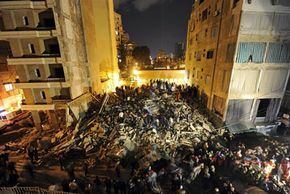 January 20, 2012: A badly maintained apartment block which was home to some 50 people, collapsed like a pack of cards in Beirut this week, killing at least 25 people. A teenage girl and her grandmother, an elderly man (73), and several labourers from Sudan, Egypt, Jordan and the Philippines are known to have died instantly. At least 12 others survived, including the twin sister of the teenage girl. According to Lebanese officials, it was almost as though there had been a terrific earthquake when the six-storey building crashed to the ground. On Monday, General Raymond Khattar, who is head of Lebanon’s civil defence, told local reporters they hoped to find survivors in the rubble. 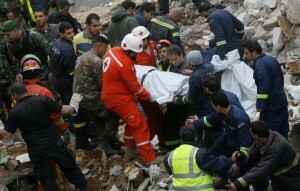 But as rescue efforts continued through the week, only bodies were retrieved. Former residents who were interviewed after the disaster claimed that the owner of the building had warned his tenants to leave the building, clearly because he realised it wasn’t safe. They said it was extremely run-down. Speculation is that thunderstorms accompanied by heavy rain might have lead to the collapse. It is thought that nearby construction work might also have been a factor. After the incident, it emerged that there are numerous buildings in the country that have been built illegally and/or have been extended without local authority or government permission. After President Michel Sleiman and Interior Minister Marwan Charbel had visited to site of the tragedy, it was announced that the government planned to survey buildings to pinpoint serious building irregularities. The government has announced that the families of victims will each be paid $20,000 compensation, and those who survived will be given alternative housing which is safe. The owner of the building, Michel Saadeh, has been arrested. Could this Happen in South Africa? While our National Building Regulations should prevent anything like this from happening, construction accidents do occur from time to time – and sometimes with fatal circumstances. Not that long ago a concrete slab collapsed on a building site, killing a man and severely injuring several more. The incident made newspaper headlines. According to Dr. Roderick Rankine, a South African engineer and expert in construction materials, who is also a highly qualified concrete technologist, the contractor did not follow engineering specifications. In this instance, the builder is understood to have mixed his own concrete on site and he didn’t bother with test cubes. It emerged after forensic investigators had inspected the site and completed their investigation, that because the builder didn’t know how strong his hardened concrete was, he simply left the props supporting the slab in for six weeks – hoping beyond hope that this action would increase the strength of the concrete to its maximum. Then he removed the props – and like the building in Beirut, the slab collapsed. The forensic investigators discovered that the strength of the concrete was less than 3 MPa! Other than buildings collapsing because of fire, most (but not all) of this type of incident (where a building collapses) seems to happen on construction sites. October 2011: A section of an historic building in Brakpan, built in 1905, collapsed during renovation. October 2011: A building under construction at Rand Airport Park collapsed critically injuring at least four construction workers. In all about 14 men were injured. October 2011: A woman was injured when the roof of a building collapsed in Rosebank, Johannesburg. It is thought that work on an adjacent construction site might have been the cause. July 2010: A building under construction in Brakpan collapsed, seriously injuring several workers on site. July 2009: The roof of a shopping mall in Newlands, Durban collapsed, injuring at least 11 people, seven seriously. October 2008: At least two workers were killed and more than a dozen others injured when a half completed office block collapsed in Roodepoort. 2004: according to the Engineering Council of SA, at least seven buildings collapsed in KZN. Another one we are not proud to mention, see more info from this article. A collapsed slab on an additions and alterations and council says plans were not approved. On building collapses. Where roof structures are concerned failure is not usually the truss but the lack of bracing. Few people outside the industry understand the requirements of SANS 10243. even engineers. Note we are all idiots outside our specialty. Hi Mark, Pre-Fab trusses only have to be strong enough. How are you determining the number and size of bolts? When ever I have tried to replace nail-plates with bolts all the timber sizes had to be increased to allow adequate edge and end distances. Your bolted truss will cost more in time labor and material and give you an uncertain result. Further you may not build a girder truss using empirical design. Good luck with your research. I am afraid I do not offer a free service to undertake research for people. I am personally registered with the NHBRC. Where/ how do I find a competent person to erect a tiled roof? I know all the regulations and specifications of trusswork including bolts in the right places (everywhere there is a join) and the right dimensions and class of timber for the spans and so-on. I dont see how a pre-assembled trusses can be as strong as the ones I design on site .Impossible! – and other many reasons. Thank you so much for taking the time to respond Julius. You are so right! It is important that we take seriously our professional rsponsibility and also educate the community the importance of engaging qualified professionals when undertaking building development. 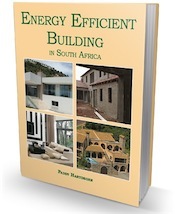 i am doing a research on the current South african building regulations and how it impacts on quality managment system. Looking for articles and everything i can get on this topic.